The team of Bruce and Selina run atop the roof of one of Gotham’s many high rises. They are being chased by a local crook who is attempting to apprehend them for stealing his money. Bruce seems to be enjoying his newly found life of crime so much that he actually throws much of the money off the roof. After all, Bruce doesn’t really need the money; he’s simply stealing for the thrill of it. He considers hanging out with Selina a tactic to learn the ways of Gotham’s criminals but in my opinion, Bruce is having the time of his life. Word of Jim Gordon’s escape from prison is all over the news. When Captain Barnes questions Detective Bullock about Gordon’s whereabouts he adamantly denies knowing anything about it. Barnes reminds Bullock that harboring a fugitive is a crime but there’s no way the detective is going to help the police find Gordon. Bullock and Gordon get to work trying to find out who framed Gordon and why. They quickly realize that the person behind the framing has to be connected to the police force. The problem is that Gordon has made too many enemies in the police force to even narrow the list of possible suspects down. Bullock suggests that Gordon just live his life on the run but that isn’t an option. Gordon wants to clear his name so that one day he might be able to live a normal life with his ex-girlfriend, Leslie Thompkins. The two detectives start their investigation with the anonymous phone call received by Internal Affairs from someone who was obviously pretending to be the late Officer Pinkney. They need to get a hold of the recorded phone call to see if there is any evidence of the person who actually made the call. In order to get the key to the evidence room, Harvey Bullock seduces his friend Ginny from Internal Affairs. This allows him to pass her keys off to Gordon so he can retrieve the tape. Gordon manages to steal the evidence and make a clean getaway from the GCPD. As he walks down a dark alley he’s distracted by a woman in distress being tormented by a couple of thugs. Gordon hesitates for a moment but he isn’t able to leave the woman in danger. He wards off her attackers and goes to check on the woman but unfortunately for Gordon, the woman doesn’t seem to care that Gordon just saved her life. In her eyes, he’s still a convicted murderer and fugitive of the law. She screams and runs away terrified for her life causing a cop to approach Gordon. Quickly realizing who he’s encountered. the cop calls for backup, forcing Gordon to flee into the night. Oswald “Penguin” Cobblepot, weeps at the altar in the cathedral during the funeral of his late father Elijah. His new step-mother, brother, and sister look on with little remorse as Penguin cries his heart out and mourns the loss of his father. After the funeral, Grace wastes no time informing Penguin he is no longer a member of the family. I mean, Elijah didn’t exactly have enough time to write his son into the will and sadly Grace was never a fan of Penguin from the moment she laid eyes on him. Penguin begs and pleads until Grace decides to allow him to stay as an indentured servant. Penguin happily accepts the offer, not realizing that she doesn’t have his best interest at heart. At a crazy group therapy session with some of the criminals of Arkham Asylum, Dr. Hugo Strange listens to the Barbara Kean remorseful testimony. Kean, Gordon’s psychotic ex-girlfriend, has recently awakened from a coma and is now being monitored closely by Dr. Strange. Barbara tells Strange that since she’s been awake she hasn’t been feeling crazy at all. His assistant, Ms. Peabody is convinced that Barbara’s new docile demeanor is an act, but it’s not clear how Dr. Strange feels about the situation. However, it is very apparent that he does indeed have plans for Barbara in the near future. Gordon and Bullock better find the person behind Officer Pinkney’s murder quickly because, after Gordon’s heroic act gone wrong in the ally, there is a 10 thousand dollar reward out for the detective’s arrest. When the two detectives listen to the tape of the anonymous phone call they recovered from Internal Affairs, it’s obvious they have their work cut out for them. Whoever made the anonymous tip disguised his voice so that it would be distorted and unrecognizable. But Gordon hasn’t exhausted all his resources yet. He decides to reach out to his good friend, Ed Nygma for help deciphering the recording. Nygma is shocked and a little terrified when he enters his home and sees the fugitive detective standing in his living room area. He obviously thinks Gordon has broken out of jail to punish him for making him look like a murderer. It takes Nygma a few moments to realize that Gordon has not yet figured out that he was behind all of it. He has no choice but to go through the motions of helping Gordon with the tape as to keep from raising suspicions. The bullying of Penguin by his new family starts very quickly. They force him to cook and clean while they make snide comments about his mother, throw food at him, and make huge messes of the rooms he’s already cleaned. The old Penguin would’ve never stood for this kind of abuse but ever since he’s left Arkham, he is a different man. He’s almost oblivious to the fact that he’s even being mistreated. Nygma finds it much more difficult than he anticipated to hold it together while Gordon is in his apartment. They can barely make small talk without Nygma acting more and more conspicuous. At one point Gordon calls Pinkney’s killer a psychopath and Nygma gets noticeably defensive. Gordon catches on and Nygma ultimately tips his hand admitting that he was the person that set him up. Gordon isn’t quick enough to react before Nygma knocks him out cold. Nygma drags Gordon’s body out of the apartment but when he turns to open the trunk of his car, Gordon makes his move. He darts into a nearby building as Nygma fires a bullet into his leg. 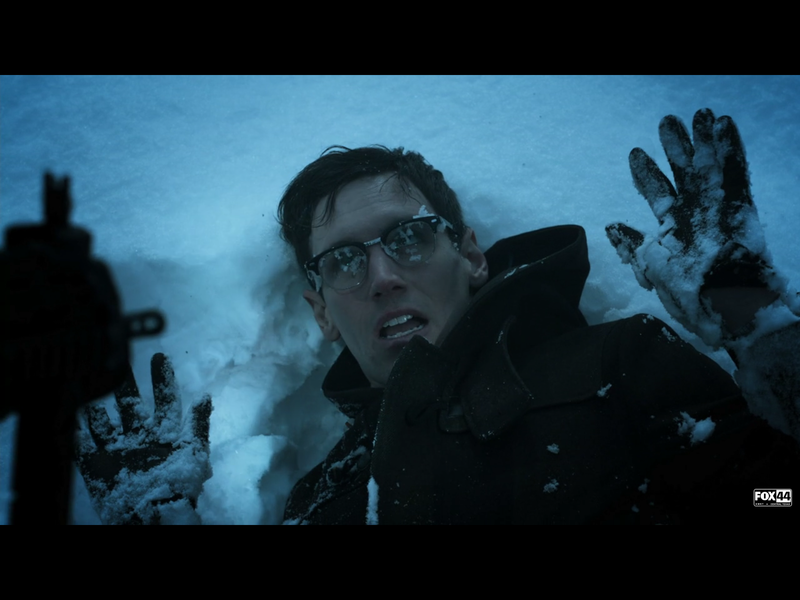 Nygma tries to track him down but even with a wounded leg, Gordon narrowly manages to escape. But who does a detective with a 10 thousand dollar reward on his head turn to for refuge in Gotham City? Selina and Bruce are stunned to see Gordon hobble into their hideout. He announces that he’s found the person that framed him then passes out onto the couch. With nowhere else to turn, Bruce calls Alfred to transport the unconscious Gordon to Wayne Manor for treatment. Penguin is letting the stress of catering to Grace and her children get to him. While frantically searching for cherries to put in Grace’s martini, he finds the decanter with a corner of the alcohol his father was drinking before he died. The curious smell of the liquid in the bottom of the container intrigues Penguin so he pours a little on a saucer for the family dog to take a sip. Seconds later he witnesses the dog foam at the mouth and die in the same exact way his father died just days before. Elsewhere another “rehabilitated” killer is released from Arkham by Dr. Strange. He knows Barbara Kean may still be dangerous but he’s interested in how she will react once she’s free. Ms. Peabody warns Strange that freeing psychotic criminals into the world could earn him a bad reputation but he does not care. He’s only focused on the outcome of his experiments. Gordon, Selina, Bruce and Alfred all strategize on how to prove Gordon’s innocence. He figures that Nygma was behind the disappearance of Kristen Kringle and if he can locate the place where Nygma buried her body, he might be able to prove Nygma’s involvement. Gordon enlists the help of Selina to set the trap for Nygma. She goes to the GCPD and very loudly announces that she has information about Gordon’s whereabouts. Selina tells Captain Barnes that Gordon is looking to find Penguin, and Nygma goes into a panic. Nygma knows he needs to move Kristen’s body before Penguin tells Gordon where it’s located. He plays right into Gordon’s hands. Not only does he lead Gordon right to the body but he unknowingly admits to his crimes with the GCPD listening nearby. The police officers have Nygma surrounded and arrest him with all the evidence they need to convict him of the murders of Kristen Kringle and Officer Pinkney. Knowing the truth about his father’s death has triggered something in Penguin. There is a noticeable difference in his mannerisms and demeanor when he serves Grace her dinner. Grace starts to pick up on the subtle changes as she eats but she’s distracted by the fact that her children are nowhere to be found. Penguin reveals to Grace that he knows she poisoned and killed his father. She cries out for her children to come to her rescue but Penguin informs her that she has been eating them the whole time. That’s right. Penguin has killed both the children and fed them for their mother for dinner. She screams in horror one last time before Penguin stabs her in the neck with a large knife. The Penguin is officially back to his murderous ways. At the GCPD, Captain Barnes makes amends with Gordon. He even offers the detective his job back. Gordon declines the offer because he still has some unfinished business. He promised Bruce he would solve his parents’ murder and he doesn’t intend on coming back to work until he’s gotten to the bottom of it. Meanwhile at Wayne Manor, Alfred informs Bruce that his father’s computer has been repaired. This means Bruce can use the computer to continue his father’s investigation into the corrupt inner workings of Wayne Enterprises. But Alfred refuses to let Bruce endanger Selina by dragging her into his drama. He has to make a choice between hanging out with Selina and continuing the investigation. Ultimately, Bruce chooses the investigation. Hurt, Selina ends their friendship and storms out of the mansion. The last scene of the episode shows Gordon struggling with whether or not he should contact his ex, Leslie. He calls her on the phone but when she answers he can’t even bring himself to speak. There’s a knock at his apartment door and when Gordon opens it, he finds himself staring into the face of someone he never expected to see; his ex-girlfriend, Barbara Kean.